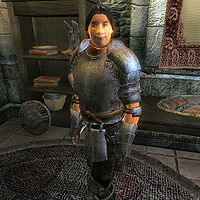 Viator Accius is an Imperial smith and proprietor of Stonewall Shields in the Market District of the Imperial City. He sells a wide variety of armor, including the unique heavy shield Tower of the Nine, and offers repair services. A master of his craft, Viator spent nine years training with Orcs to learn all of their secrets. These days, he lives the hard life as merchant in the District, with plenty of work and very little spare time. He sleeps in the private quarters above the store every night between midnight and 6am and always starts the day with breakfast in the main trading room. At 8am, he unlocks the door and spends the next twelve hours offering his services to the occasional customer. At 8pm, he closes up shop and leaves. On Morndas, Middas, Fredas and Loredas, he walks down to the popular Arboretum and relaxes there until midnight. On Tirdas and Turdas, he eats a four-hour dinner at the Merchants Inn while chatting with his colleagues. On Sundas, he takes a trip to the Temple of the One for an evening prayer. During the day, he wears an iron cuirass and gauntlets, leather boots and greaves and is equipped with a steel shield. When he is asleep, he changes into a more comfortable set of regular clothing, a pair of blacksmith's pants with apron and rough leather shoes. He carries around the key to Stonewall Shields and a small amount of gold. When you meet him for the first time, he will politely welcome you to his store: "Stonewall Shields. We specialize in shields. Viator Accius, your servant." And he will not shy away from pointing you towards some other merchants in the District: "While you're in the Market District, see Rohssan's weapons at A Fighting Chance, and see Varnado and Maro Rufus at The Best Defense for armor." Esta página foi modificada pela última vez à(s) 17h39min de 27 de maio de 2013.